This is the jazz-rock trio's fourth studio album, and their first for Magna Carta. If you're familiar with Magna Carta's other offerings, you may have an idea of what to expect. 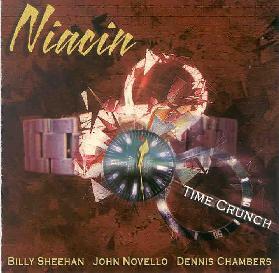 Although Niacin was originally bassist Billy Sheehan's project (an artier outlet from his regular playing with heavy metal group Mr. Big), this album has keyboardist John Novello's mark all over it. Novello comes from a jazz background, but his dextrous style includes many rock influences as well. His Hammond B3 organ dominates the sound (though there is also a considerable amount of piano, and a little sythesizer here and there), but Sheehan and drummer Dennis Chambers create magic together as well, giving the music its driving momentum. The album has plenty to offer in the mould you might expect, from tracks like the aptly title Elbow Grease, a high energy fusion workout that may cause smoke to pour out of your CD player, to Daddy Long Leg, a jazzy blaster that's part Herbie Hancock, part early Santana. But it also offers up a few things you might not expect, as on Invisible King, where Novello gets into a great Dave Stewart kind of thing on his organ, giving the piece a lovely Canterbury feel, and on Glow where he mellows out nicely in a reflective Lyle Mays style. The real surprise on the album came for me in the absolutely blistering cover of the King Crimson track Red. I didn't clue in when I read over the song titles, but the moment the track started I recognized it. Not that Niacin doesn't put a spin on it that is all their own; it fits in perfectly with the rest of the album. Imagine organ taking the place of guitars on the original, with a slightly deeper and fuller sound, and you'll get the idea. Red has become, perhaps more than any other Crimson album, a great influence on many contemporary rock bands (Tool comes to mind). With its harsh guitars and the fragmented angst of a band that was disintegrating, Red was a masterpiece far ahead of its time (1974). While much of Niacin's own original material has a retro feel to it, covering this old piece lends an ironically modern touch to the album. The production is top notch without overdoing it, and Novello's arrangements avoid the over-complexity that could bog them down, leaving the music to roam about and have a good time. There's nothing new or terribly innovative here, but I found the keyboard/bass/drum combo quite refreshing and I can't really say there's a single weak track on the album.